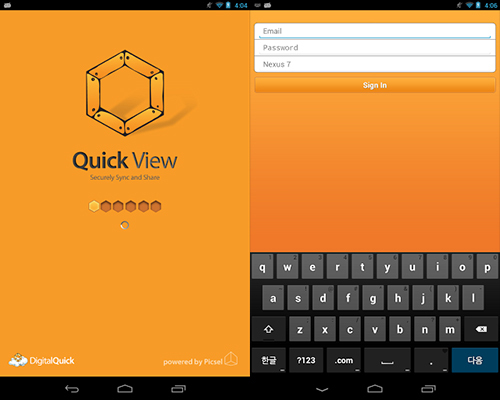 Quick View is a free android application which serves as a companion to DigitalQuick. DigitalQuick is a service that would allow you to encrypt your files on your computer and on Dropbox. It also allows you to set permissions for what other people can do with your documents whether they can view them, edit them, copy them and print them or not. Quick View is a simple application that would let you view secure files on your Android device on the go and that too really quick which can serve as an appropriate too if you are carrying sensitive data in your phone. Firstly, you will have to encrypt your documents on your computer using DigitalQuick and move the files to your mobile. After that, of course you will have to open up your favorite file manager and move the documents inside the Quick View folder. You will have to wait around ten minutes after moving before the files sync with Quick View and until that time you will receive error messages if you try to open the files. You cannot manually refresh the application so unfortunately you will have to wait for ten minutes no matter what you do. Once you have access to your documents, you can remove all permissions and encryptions if you so feel and share the documents with other people at your will. Of course, there is not point to security if that is what you want to do. The application will also allow you to share your files via e-mail which can be very useful in certain situations. If you do not use Digital Quick however, Quick View will serve no purpose for you. One thing to understand here is that having your files encrypted through Digital Quick is a direct prerequisite for viewing them using Quick View in your handheld device. The application will prove to be useful for that faint population of android users using Digital Quick and of course it has a long way to go before it hits the mainstream nevertheless, if you are into security and protecting your documents, this is the best way to go for it even though it is a little slow, but let’s face it, ten minutes is not that long a time. You can download the application for free on the Google Play Store and it is compatible with Android devices running OS 2.2 and up. Let us know what you think in the comments.